What To Eat In Greece: 14 Dishes You Can't Leave Without Tasting! 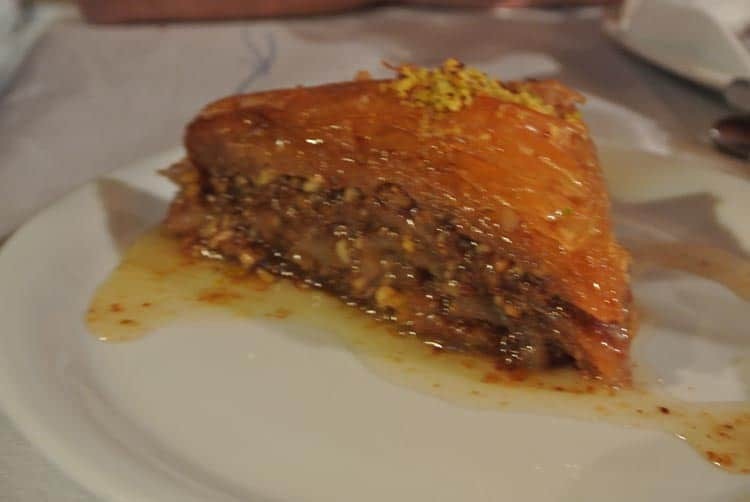 What To Eat In Greece: 14 Dishes You Can’t Leave Without Tasting! Going to Greece was such an amazing experience. We swam at beautiful beaches, learnt about ancient history, felt immediately relaxed in the spirited communities, and ate some delicious food. 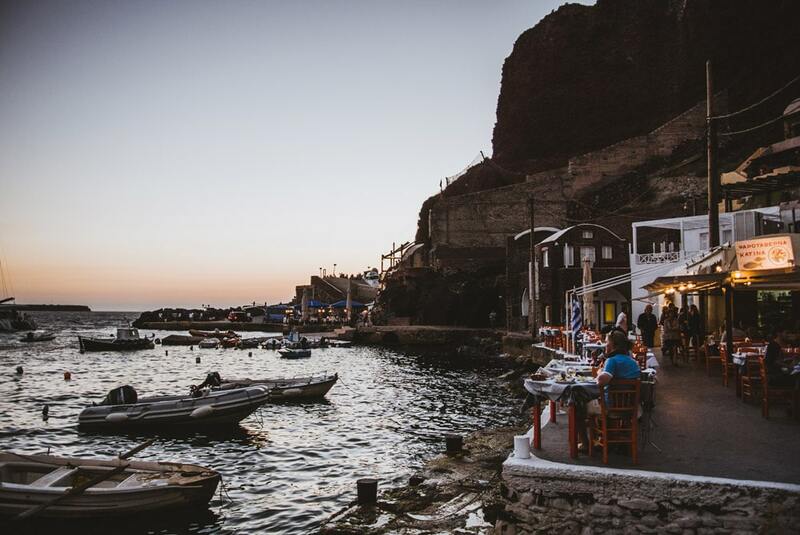 It’s safe to say, Greek food definitely left an impression. 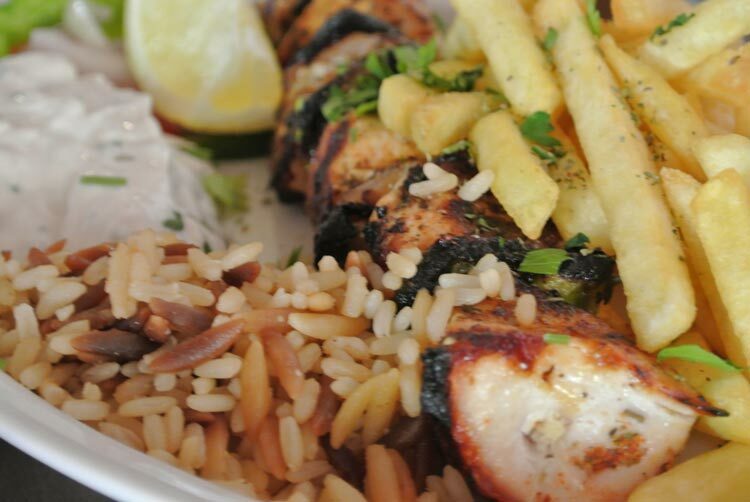 A lot of traditional Greek foods seemed somewhat healthy but full of flavour, which is a perfect combination. The fresh produce was great quality, and the desserts didn’t disappoint. So if you’re wondering what to eat in Greece, below we have 14 dishes you can’t leave without tasting! 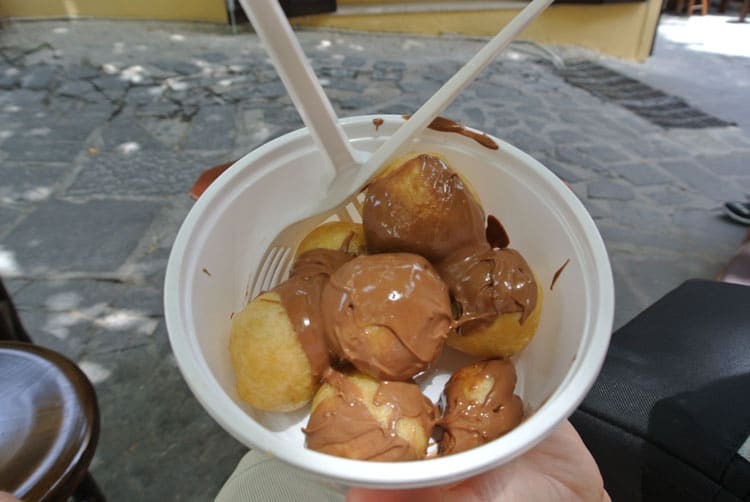 I first tried loukoumades from a traditional little store in Rhodes. After I discovered this sweet dessert, I just kept going back and back for more. 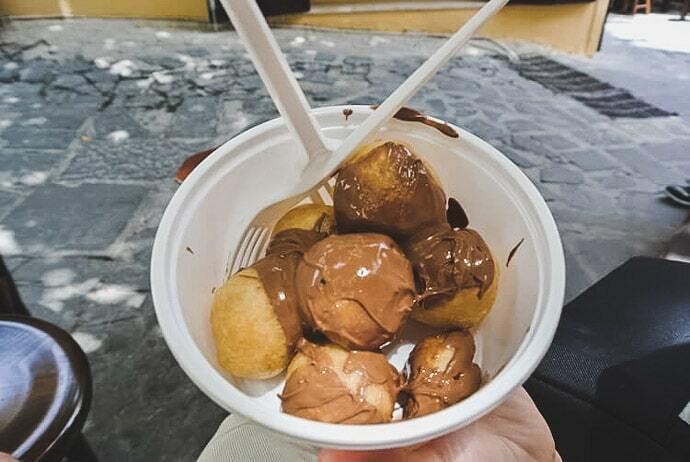 Think greek donuts with honey and nuts (or chocolate sauce). Watch a video of us making it and get the loukoumades recipe too. 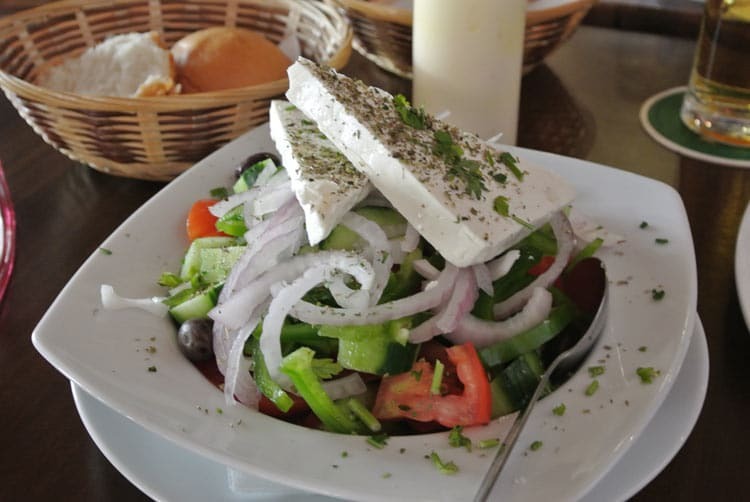 Do you know what I love about a Greek salad in Greece? The way they put a giant block of feta right on top! That, and the tomatoes taste delightful. Greek salad became part of my everyday diet. 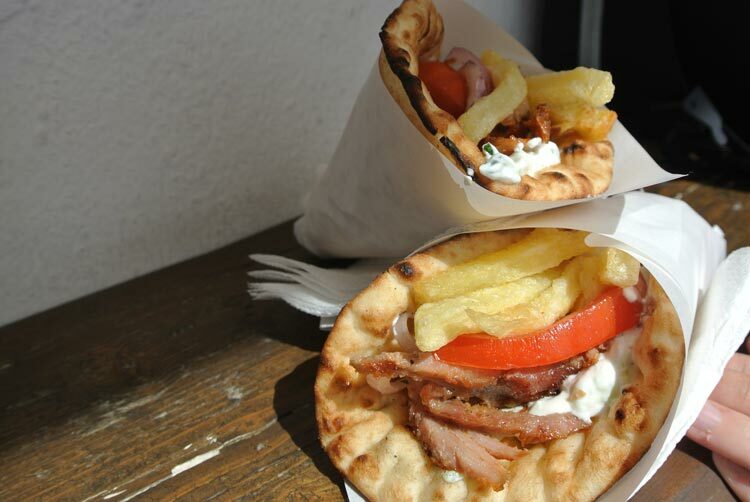 Similar to a kebab with the added bonus of Tzatziki and chips, all in a delicious pita bread. A simple and cheap lunch meal. A traditional Greek dish I hadn’t heard of before. 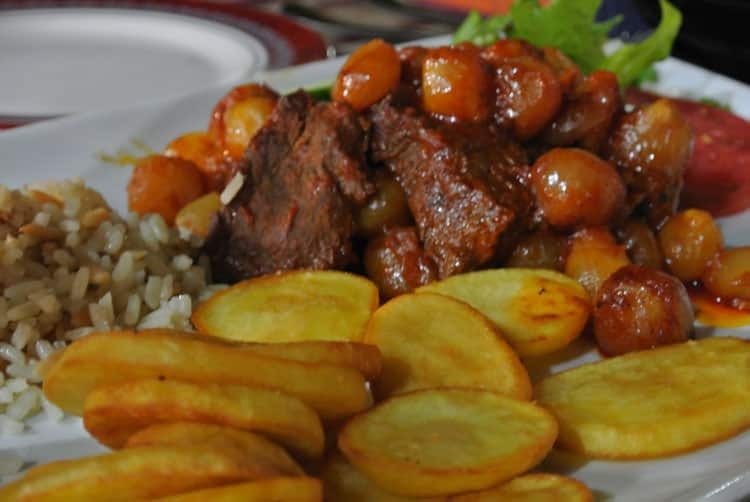 Think slow cooked beef stew with onions in a tomato based sauce. Delicious! 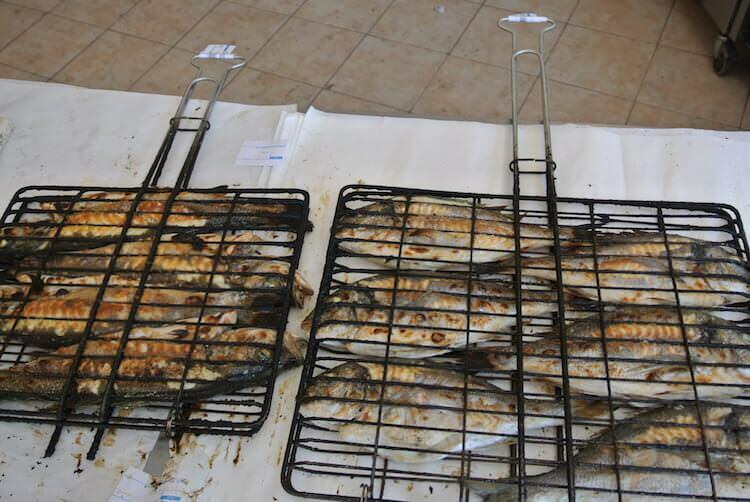 Greece is blessed with great quality fresh seafood. 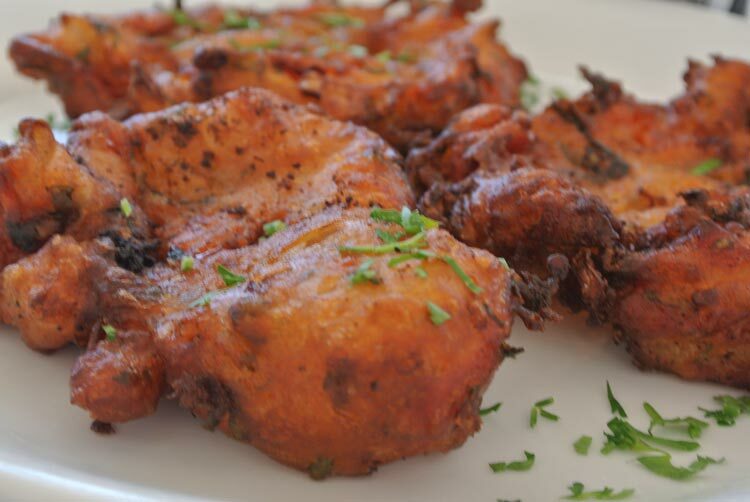 Sometimes it’s best kept simple, grilled with lemon on top. As mentioned above, fresh seafood is at it’s best. This one’s a crowd pleaser. Ok, so I only saw this once in Greece, so it may or may not be a traditional greek dish. Either way, it’s an absolute must try. 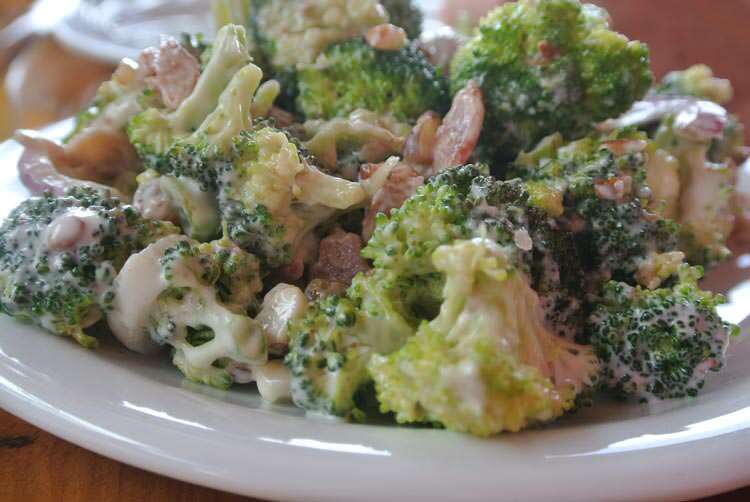 Trust me, you will never look at broccoli or salad the same way again. We had it at Fokos Taverna in Mykonos. Yum! I must admit I had amazing and average versions of these depending where we were, but when they’re good they’re delicious! 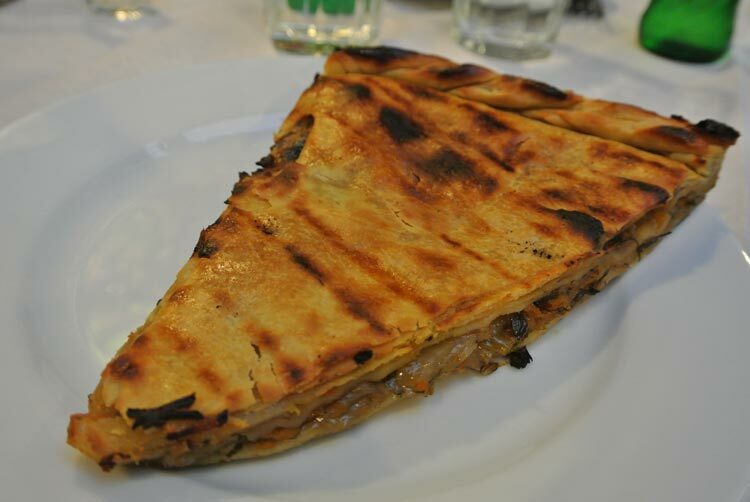 Again, I think the spinach and onion pie is more traditionally Greek, but I ordered Onion pie in Athens and it blew me away. Onion pie… who would have thought! Tzatziki is good at home, but it’s even better in Greece. 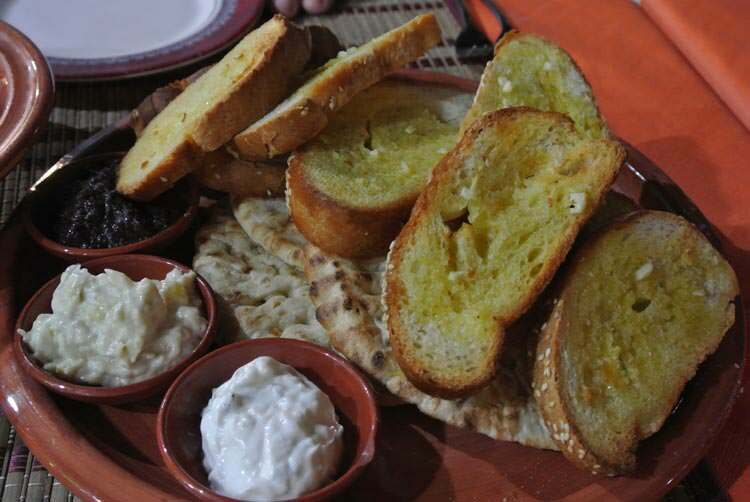 They also have other dips, like fava, skordalia, hummus, melitzanosalada and many more that are so delicious. 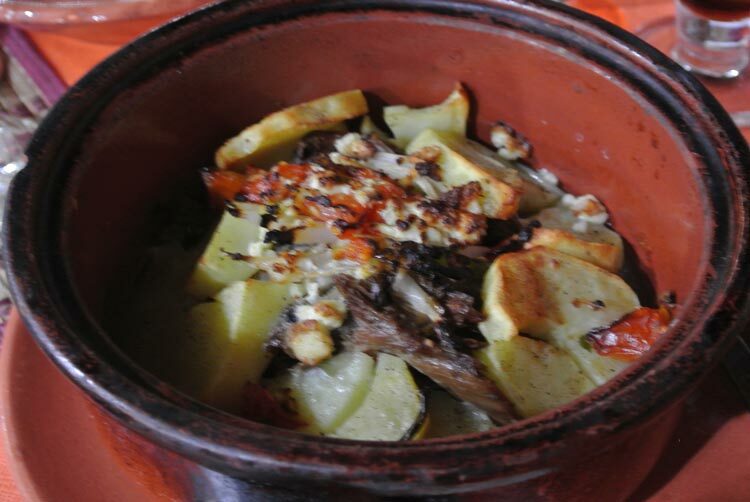 Another traditional Greek dish, lamb kleftiko is slow cooked lamb with garlic, lemon and array of herbs and vegetables. 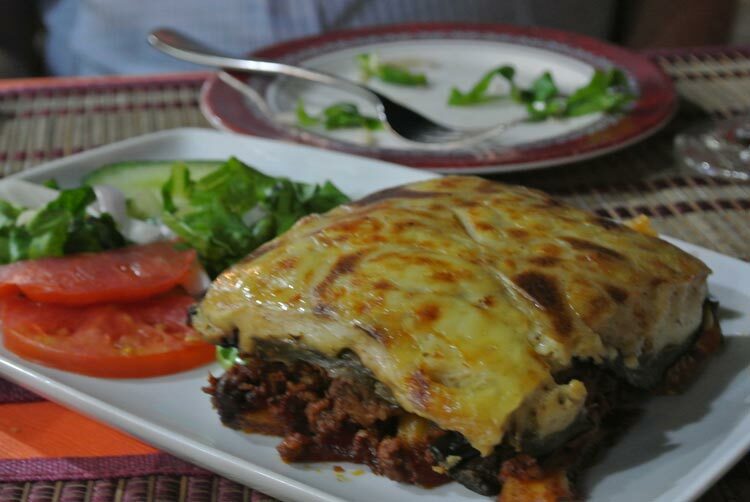 Moussaka is a classic Greek dish made from eggplants, ground lamb, and tomatoes with a creamy sauce topped with cheese. Cooked meat on skewers, simple and tasty. 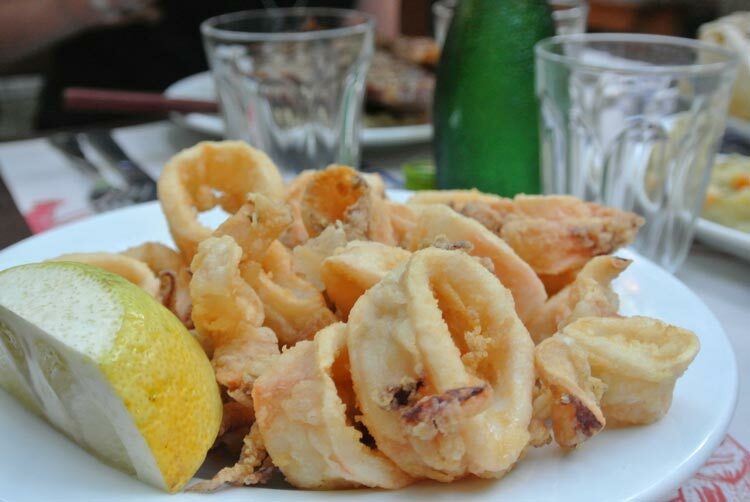 What’s your favourite pick for what to eat in Greece?